In the world where synthetic materials are found in just about anything, there is beauty in using products sourced straight from nature. Shiny Leaf Cosmetics is all about creating great skin & hair and promoting overall wellness with products that contain all natural ingredients. Within these pages, you’ll find all sorts of details on the Shiny Leaf Cosmetics brand and all of their amazing offers. You’ll get the latest on new products that they produce and when Shiny Leaf will release them into the market. If you want to stock up on your favorite products, you can get the freshest updates on sale items and discounts from Shiny Leaf Cosmetics. Shiny Leaf Cosmetics is a proud American company that produces high-quality beauty products sourced naturally from nature’s bounty. This means ingredients that you know and that don’t need a Ph.D. in order to understand and pronounce. Shiny Leaf Cosmetics uses the freshest and best raw materials when creating their beauty products. They create products your skin, hair, and body loves. They create products that are cruelty-free and does not contain harmful chemicals. Cosmetics and other beauty products are made to highlight a person’s best features. The known origins of cosmetics date back to 5000 years ago when the Ancient Sumerians crushed gemstones to add color to their lips. The Ancient Egyptians were also famous for bathing in natural oils, honey, and milk. Today, modern technology has made mass producing beauty products easier so there’s no need to crush gemstones to make pigmented lip colors. Many of these mass-produced beauty products have chemicals and synthetic ingredients. Over time could cause more damage to your skin, hair, and body. The best way to have beautiful skin is to create a good skin care routine and stick with products that have natural ingredients. Natural products like those created by Shiny Leaf Cosmetics. Cosmetic and beauty products made with natural ingredients are gentler and safer for use. These products benefit all skin types and not just sensitive skin. Products made with all natural ingredients do not clog the pores and irritate the skin the way synthetic cosmetics do. Shiny Leaf Cosmetics do not contain parabens, sulfates, and dyes that can harm your skin. Their ingredients come from natural sources such as oils, organic products, and mineral clay. Products that use natural ingredients are becoming more popular as more and more people are becoming aware of the dangers of synthetically made cosmetics. People are also realizing the benefits of using all natural products so they have become pickier about what products to put on their body. Shiny Leaf products contain only the best ingredients sourced locally to ensure that you get the freshest extracts and essences. Using the best ingredients ensure that you get products that are effective and works fast. Castor Oil for example, when used as part of a hair conditioning regimen, helps give you softer and smoother hair. Shiny Leaf Castor Oil is cold-pressed and certified organic. Find the right mix of all natural ingredients that take care of all your skin, hair, and body in the DIY pages of Shiny Leaf Cosmetics. Create a mix of potent oils and plant extracts to banish pimples, heal acne, and make dandruff go away. Combine various oils and create a blend that can relax your senses and heal your ailments. Brew your own fragrant smelling air freshener using oils, plants, and flowers. Shiny Leaf Cosmetics offers all this and more. 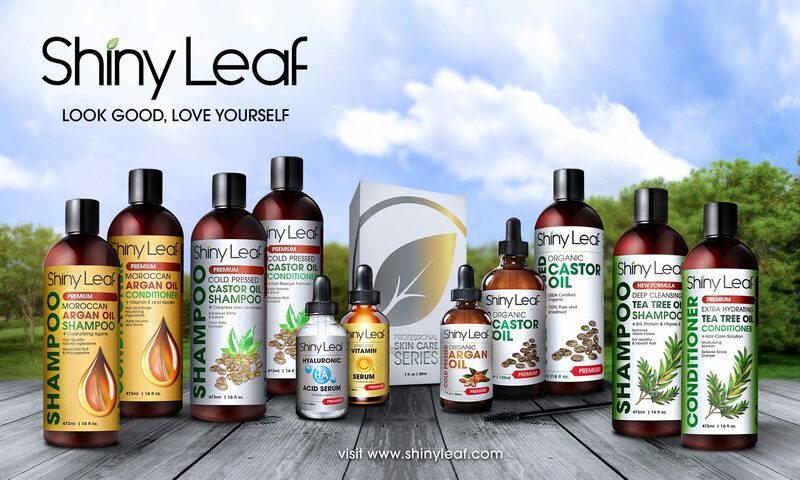 Explore Shiny Leaf Cosmetics and discover what a good all-natural skin and hair care is all about.